I woke up early and got started on todays tag that was inspired by Tim Holtz Day 3 of his 12 Tags of Christmas event. Here is the inspiration tag. First, since I didn't have a kraft tag I sponged on distress ink in Frayed Burlap and Antique Linen. Then I inked the large Hero Arts Background stamp with the three holiday distress inks - Festive Berries, Evergreen Baugh and Iced Spruce and stamped it on the tag. I inked the edges with Vintage Photo distress Ink. For the leaves I used a Spellbinders die and used grunge paper. I colored the leaves with Evergreen Pine Distress Stain and sanded the edges. I glued them to the tag with glossy accents. Then I added red rhinestones for the berries. For the top I just added a canvas ribbon. The star is a Spellbinder die on grunge paper. I put tissue tape on the star, colored it with a copic marker and inked the edges with my gold dabber. Then I added Rock Candy Distress Stickles to the tape and dried it with the heat gun. I attached it to the tag with Stampin Up Linen Thread. I thought the star looked interesting after it wrinkled up when I used the heat gun on it to dry the Distress Stickles. Here's a close up picture. 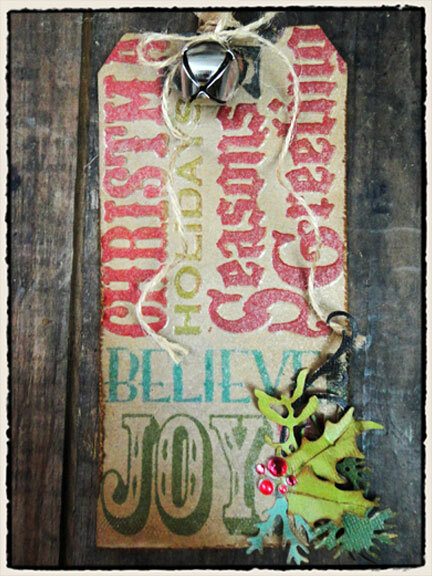 The colored twine is called Christmas from Doodlebug Designs. Thanks for taking a look! Love the new inks! Beautiful the way you stamped the background, Donna, and that star is fabulous! gorgeous! what a perfect stamp to use. and that star looks so great, love what you did with it! What a fab tag Donna! Love how you stamped the sentiment and that star is fantastic!! Very creative! I love your background and the star and holly are perfect!